It’s sensory perception that opens us up to the realities of the universe. It forms the basis for all our extrapolations and all baseline theory on which our conceptual worldview is ultimately formed. 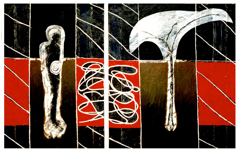 Visual artists are immersed in the experiential encounter and if we ignore the value of intuitive record, dismiss it as being merely ‘subjective’ and therefor inadmissible building an ontology around objectivity from a conceptual understanding alone, we will at best, be operating partially ‘blind’, divorced from the realities of 'meaningful' objectivity. Sensory perception forms our ‘relationship with the real’ and should guide us in our intrinsic thinking about the nature of reality. Our sense of vision is determined by light, a free moving micro particle or electromagnetic radiation. How we perceive our world, is watermarked by micro scale activity, its interface with the macro condition and then how our visual system and mind deal with its onset forming perceptual structure. Our understanding of subatomic particles derives mainly from the collisions taking place in the world’s accelerators. However this is not far removed from the physical activity of photons bouncing off objects, their passage through the background light field (Electromagnetic radiance) and their collision with receptor cells providing the lead input data to the retinal membrane in our eyes. 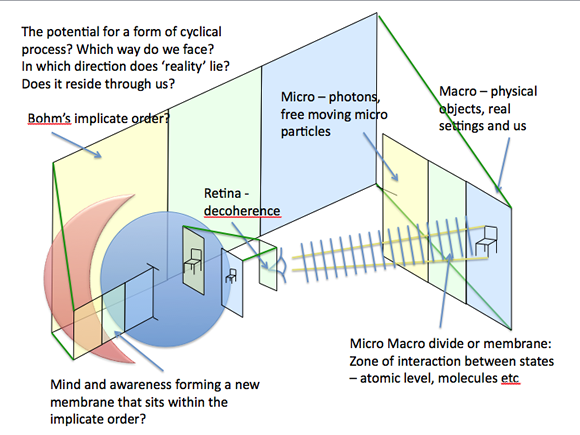 The reality of micro particle physics and its interface with a macro theatre of operation forms an integral part of our perception of the world. Vision requires our embodiment in the environment and the universe and we need to form an understanding of the phenomenon on these terms.